We offer superior quality polyester fibers and then we are the perfect destination for you. 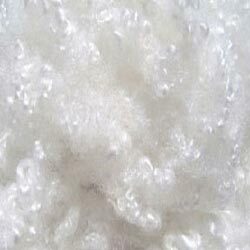 We supply various types of polyester fibers like virgin & recycled polyester fibers from 1.5d to 15d. In virgin, mostly fibers meant for spinning are supplied. In recycled polyester fibers, we supply solid fibers meant for textile spinning mills and non woven like automobile fabrics and interiors. Besides this, we also offer products for fillings like cushions, pillows, quilts, toys etc. We have hollow fibers (mechanical crimped) and hollow conjugate fibers which are used mostly for fillings and non-woven. We can supply dope dyed polyester fibers in variety of sizes and colors suiting to the demands of customers. We are ranked as one of the most dependable recycled polyester fibers exporters and suppliers from india. if you interested then contact us.